The brightly colored Motiv Tag Cannon stands out on the lanes in a good way. 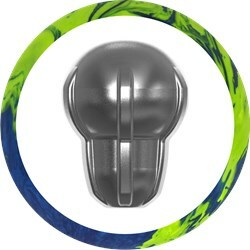 This ball was designed for light oil conditions to provide length with a quick response on the backend as well as great continuation. This design is achieved by combining Motiv's Halogen core with their Agility Ski-Flip Pearl (SFP) Reactive coverstock. This pairing retains energy and then releases it at the back of the lane. This ball busts through the pins like a cannon ball. Due to the energy retention on higher friction patterns this ball will be attractive to many bowlers including tournament bowlers. Similar Balls: Same Hook Potential, Lane Conditions & Coverstock as the Motiv Tag Cannon. For me, the Tag Cannon blows the original Tag out of the water, It has so much better overall ball motion and can handle a little more oil as well. Not only does the Cannon pop on the shelf, it pops on the lanes as well. This ball goes through the pins so well and has great continuation. The original Tag did not come with me for many lane conditions but I can see the Cannon coming with me to many more tournaments and leagues especially those with lower or shorter oil conditions. This ball is a little stronger than the Freestyle Rush but a little weaker than the Octane Carbon so it is a perfect compliment between the two. This all can work for a stroker style player. This ball had a moderate hook on lighter oil but with a stroker style it may be a little less hook but still give you a nice backend move. What does it mean when a ball has a low differential number? The RG/differential is referring to the weight block. The low RG/Differential means it will have low flare potential. 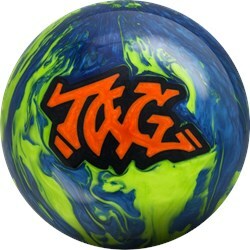 Due to the time it takes to produce the Motiv Tag Cannon ball it will ship in immediately. We cannot ship this ball outside the United States.